Stanford Cancer Center is recognized worldwide for our advanced clinical care, scientific research and technological inventions. It's all available at our newest location, Stanford Cancer Center South Bay. Stanford Cancer Center South Bay brings together world-class specialists and sophisticated technology in a spacious, serene, state-of-the-art building designed by patients, for patients. We offer the most advanced, innovative treatments, access to more than 300 clinical trials, and the ease and efficiency of a single, convenient location. 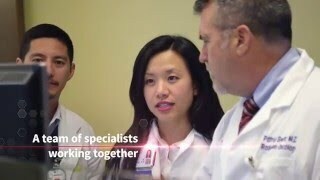 Many of our Stanford doctors are sub-specialists, with extensive expertise in an array of cancer disciplines. It’s not just about top credentials and the newest technology. Our doctors, including medical oncologists, radiation oncologists and surgical oncologists, have honed their knowledge base over years of specialty training and experience to apply their expertise to the latest technology. The result is the optimal treatment plan for every patient. Research studies that evaluate a new medical approach, device, drug or other treatment, clinical trials may offer access to innovative new therapies before they are available anywhere else. Stanford Cancer Institute is a leading contributor to the science and research of cancer treatment globally. At Stanford Cancer Center South Bay, we further the tradition of innovation, offering patients access to more than 300 clinical trials. If you would like assistance searching for trials please contact the Stanford Cancer Clinical Trials Office at 650-498-7061 or ccto-office@stanford.edu. Browse available clinical trials for cancer treatment. When Stanford Health Care decided to bring its advanced level of cancer care to the South Bay, the first step was to ask patients what they wanted. This new Stanford Cancer Center location offers every form of cancer care and clinical trials in a comfortable and convenient setting. To request an appointment with one of our cancer experts, please call 408-426-4900.